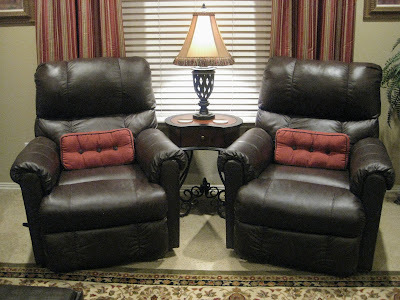 Every Man Needs A Recliner...Or Two. Hey Guys! I hope you are having a great start to your week! I want to show you what I've been working on the past several days, or I guess I should say months. 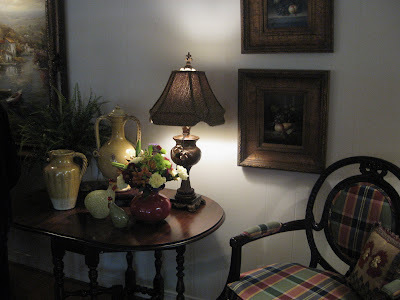 I don't think I've mentioned this room much here on my blog. I don't have a good before picture, but it was pretty blah. It was time to rearrange it and make it more of a family/movie room. My one stipulation was to keep it MANLY! Kevin has always wanted his own recliner...don't all men? We really didn't think we could fit one in this room let alone two! 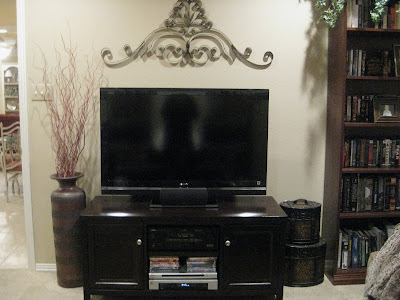 We thought and thought and finally figured it out...we had to get rid of the big stuff like the huge t.v. and over sized desk that was in here to be able to fit everything we wanted in this 14x14 space. That is a speaker in the corner in case you are wondering. 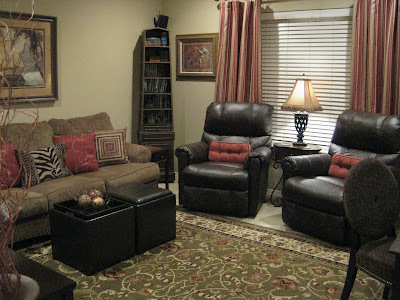 When we built the house Kevin wired this room for surround sound. It's great for watching movies! 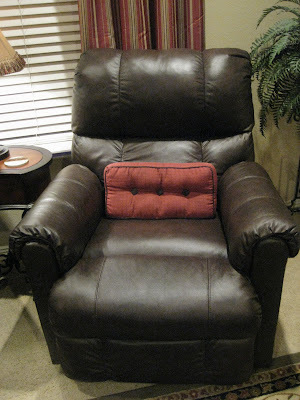 (click to enlarge all pics) I'm not crazy about recliners, but these look pretty good and are VERY comfy...not to mention a great price!! They are by Lane and the style is Eureka if you are interested. I was on a mission to find pillows, lamps, a desk chair, and a rug last week. After hours of looking and taking several things back...I am finally happy with my purchases. The pillows and table are from Kirkland's. I loved Melissa's little table she put in her bedroom so I bought one similar. I found the lamp base at Lowe's...I had the shade and added the fringe today, it really dressed it up! We purchased the sofa last year at Ashley and I added the new pillows this week. I took several back, but ended up with these... I brought one of the zebra pillows in here from the living room. It really made the sofa pop! I bought the little leather ottomans at TJ Maxx last year and added the bowl with balls today. 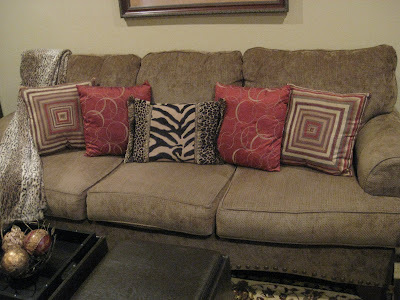 Here is a closeup of the pillows, they came from Wal-mart, Kohl's and Dillard's. I shop everywhere! We purchased the desk at Wal-Mart. 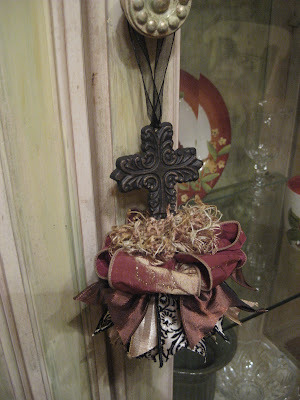 It was the perfect size and color, it has a distressed look to it that looks really neat. Wal-Mart has some great stuff at reasonable prices! 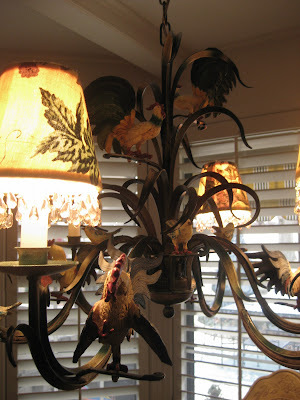 The lamp came from Kirkland's and I already had the palm tree pictures. 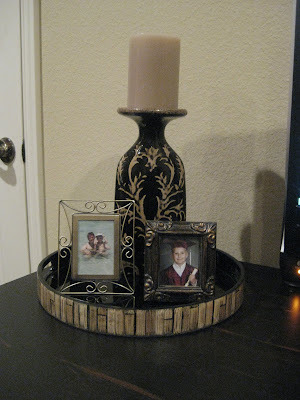 I found this candle holder today at Hobby Lobby 80% off! It was just 4.98! Here is our biggest purchase besides the chairs... 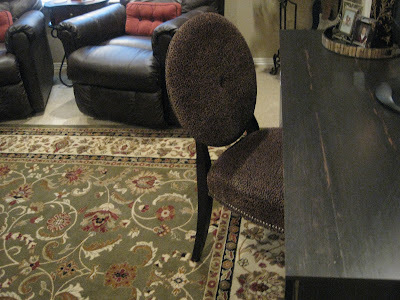 It took FOREVER to find a rug!! I brought home two before this one and they were too small. I ended up getting an 8x10 and absolutely love it! The colors are just perfect! I found it at a local interior store I had never been in before. Mom and I just happen to pass it on the way to another store. 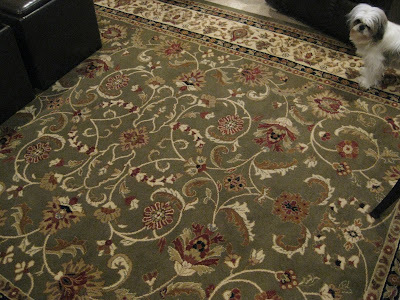 I'm so glad we stopped in there, not only did I find a rug, but I am going to work for them tomorrow! They are doing a big home show and needed some help with some floral designs. A lady who I used to work with happened to be in there and recommended me. I didn't expect that! lol... And the new flat screen t.v....this is something else hubby has been wanting for a while. It doesn't take up nearly as much room as the other one. The console is from Wal-Mart...again, they are really improving their stuff! 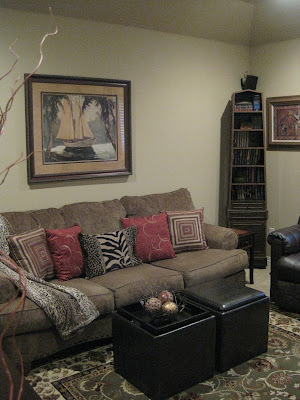 The iron scroll and trunks are from Hobby Lobby, and the large vase is from Pier 1 Imports. That's hubby's bookcase, or game case...he needs to organize it! Here is the room again...finally finished and we are both happy. I am really liking the comfy cozy feel in here. If we weren't broke we could relax! lol...we've been saving for this room for a while. 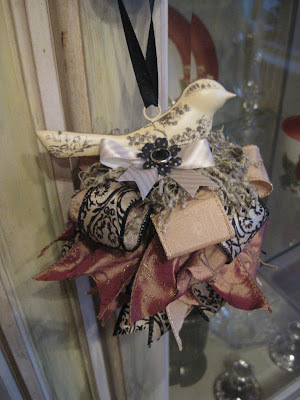 Now that I am done in here I can work on my Etsy store... I know there is not much left! Thank you for your purchases!! After tomorrow I will be making several new items. This room has had most of my attention lately! Thank you for stopping by...have a great week!! Hey Guys! I hope you are all having a great week! 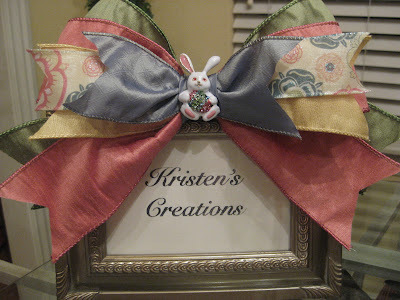 First I wanted to remind you about the giveaway Kim at My Domestic Bliss is hosting. 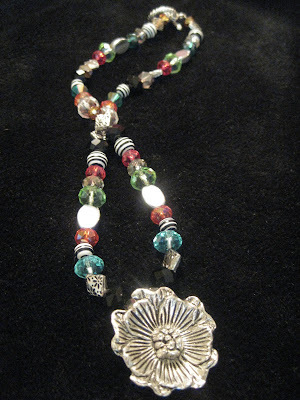 The winner will get to choose any item from my Etsy Store. 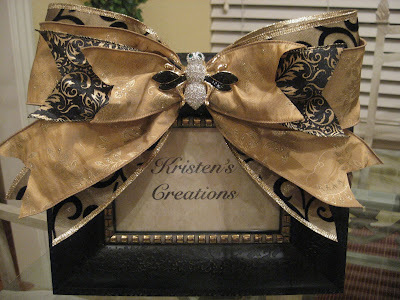 I also wanted to say that if the item is sold I should be able to recreate something similar. Do you remember when I went over to a dear lady's home to demonstrate my little Valentine terrarium for her garden club? Well, while I was there I took some pictures of her beautiful kitchen. 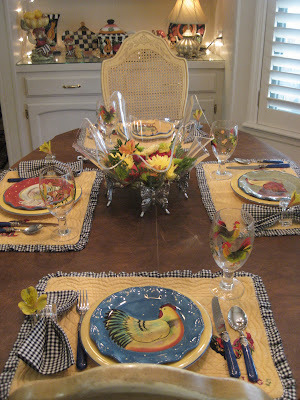 She had set an adorable table! 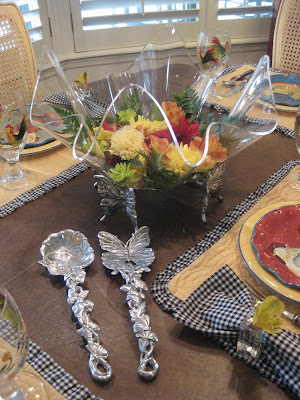 The theme of the garden party was "unusual containers". Look at that beautiful butterfly salad bowl! She even made a fresh flower salad. Too Cute! 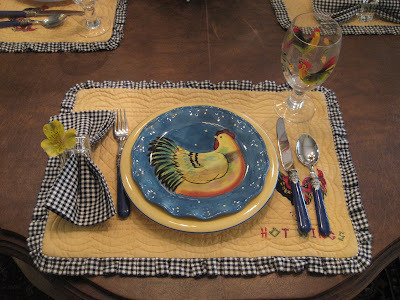 And those adorable rooster dishes...love em! 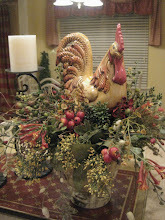 She put fresh flowers in the napkin rings...and look at those rooster glasses! 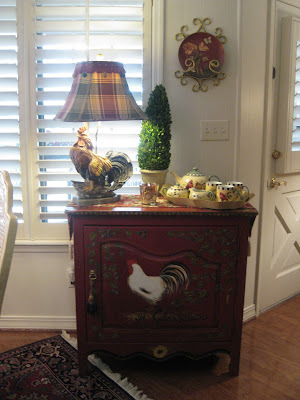 This chest and lamp are stunning too. See the little roosters on the table? Oh...and there are some on the pillow too. 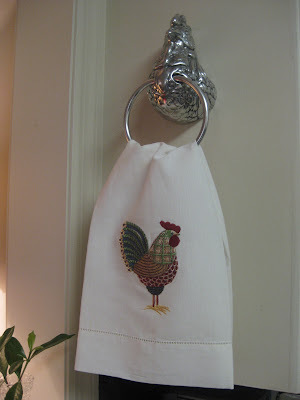 Cute rooster towel holder and embroidered towel! Aren't her roosters Fabulous?! 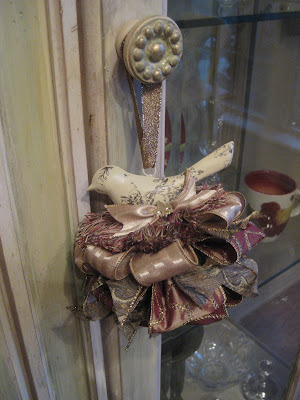 Since this post is about roosters, I thought I would post this rooster frame I just added to my Etsy shop. Have a great rest of the week! Are you guys ready for spring?? I know I am! Hey Guys! My sweet friend Kim at My Domestic Bliss is having a 100th post giveaway and it's an item of your choice from my Etsy store!! Kim has been blogging for a year now. 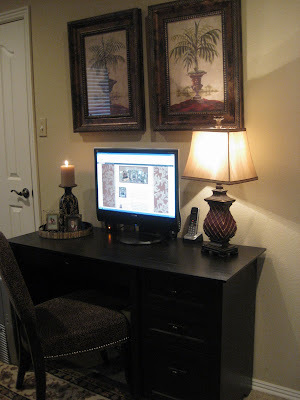 She found my blog through HGTV's RMS and decided to start one herself. 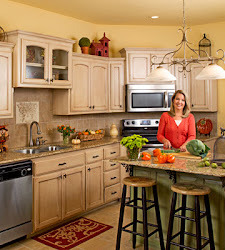 She is so much fun and has great ideas and a beautiful home! 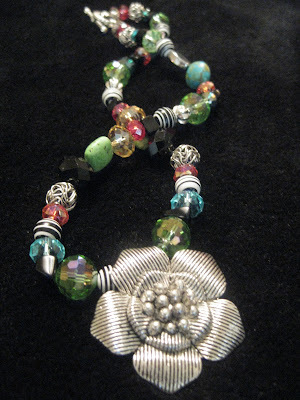 She also has an Etsy Store full of wonderful treasures...so be sure and check it out! So head over to Kim's and enter the drawing! 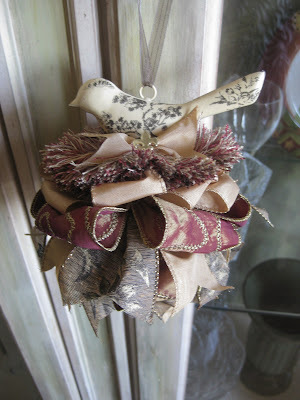 I will be listing new items in my Etsy store everyday. The drawing will be on Friday Feb. 19th. Good Luck!! More New Items In My Etsy Store! Hey Guys! I hope you all had a wonderful Valentine's Day! Mine was pretty good, we didn't do a whole lot, I mainly worked on new items for my Etsy Store. Hubby brought home Italian and we sat and stuffed our faces! lol... He bought me a really sweet card and a wonderful smelling candle that he picked out himself called lemon lavender...it smells wonderful! I was impressed! 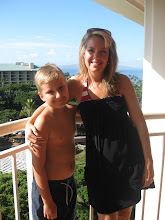 He also told me to pick out a purse I want because he had no idea what to get, so I will be shopping tomorrow! It's 1:00 in the morning, but I was determined to get this post up since I will be busy shopping tomorrow, but first I have to go to the dentist. UGG...I've had enough of the dentist! This time I had part of a tooth and filling chip out so I have to get it refilled. Anyway, it's time to move on to the next holiday! 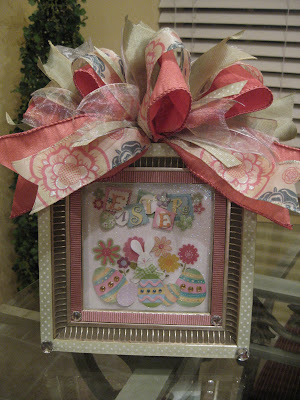 Easter!! 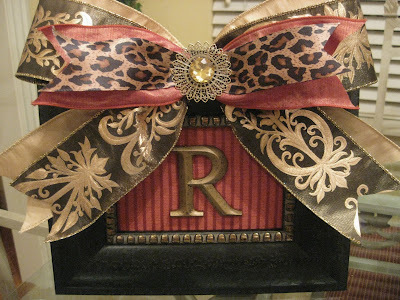 I have sold several of these initial frames...let me know if you would like one for yourself! I'm currently out of this black frame, but will be getting more in soon...it's the most popular. I added most of these items to my Etsy store tonight. For those of you who don't know where it is it's on the left hand side of my blog under "Daily Blessings". 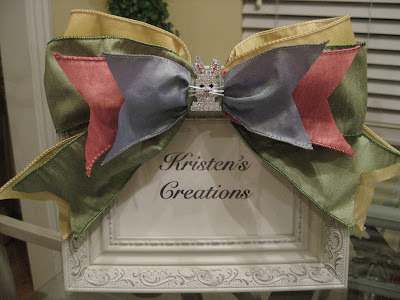 Remember to e-mail me if you would like something custom. 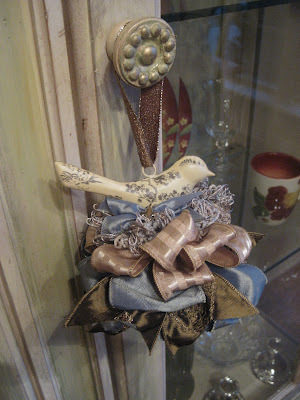 I can remake several of the items you see, but some are one of a kind! 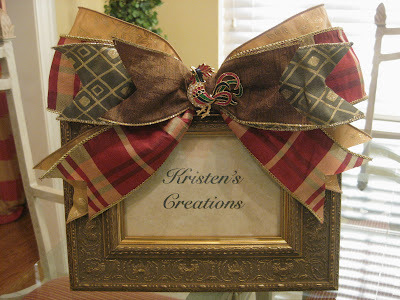 Melissa at Melissa's Heart and Home is having a wonderful giveaway hosted by Lisa Leonard. Hurry over there because the drawing is on Feb. 16. You don't want to miss this one! Thanks for stopping by!! 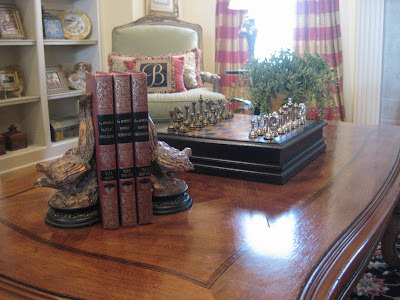 Tabletop Tuesday...Anyone for a game of chess? Hey Guys! How is everyone this week? I know alot of you are probably still buried in snow after that giant snowstorm that hit last week. We got some snow here in Arkansas again yesterday. The kids were out of school, but went back today...Chase wasn't happy about that. He was hoping for more snow, or at least ice on the roads! lol...Well, I thought I would join Tabletop Tuesday today hosted by Barb at Grits and Glamour, but today it's hosted by KD at Southern Whimsy. Be sure and visit both of these ladies. They both have wonderful ideas! After Christmas I wasn't satisfied with anything I put on my coffee table. 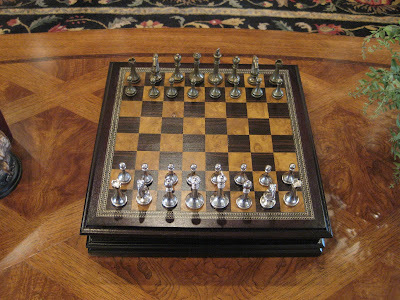 Nothing looked right...I have always wanted a pretty chess set for some reason. I don't even know how to play chess so my title is a little misleading...I just think they are interesting and handsome! lol...I went on Amazon.com and found this one on sale for $39.99 and for the price it's great! Chase is learning how to play chess and loves it! See those pretty little red books...I bought them for $1 each at a used book store. They didn't have the whole set, but I just needed three anyway. Goodlooking books are expensive so I was thrilled to find these for that price. Isn't it nice? I love the little pieces...they are metal. 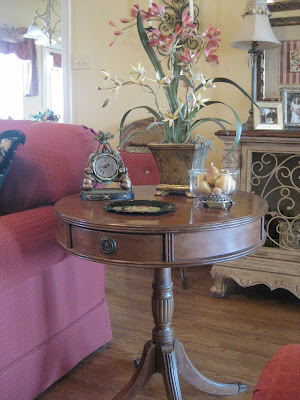 I also wanted to show you a table in our living room that is very special to me. My mother in law gave it to me when we moved into this house. She passed away two and a half years ago. She knew how much I liked it, so she gave it to me with the promise I would always keep it...and I will. I believe it is a duncan phyfe. 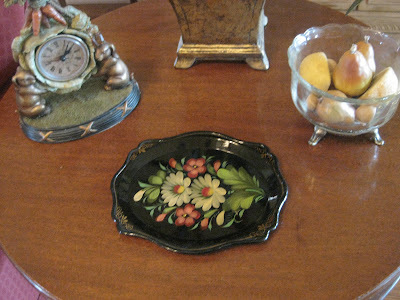 I found this cute little black tray for $2 at an antique mall. I love antique malls! You never know what you will find. See my rabbit clock? I will be showing you lots of rabbits soon! This isn't a table, but I wanted to show you some small changes I made to the mantle. 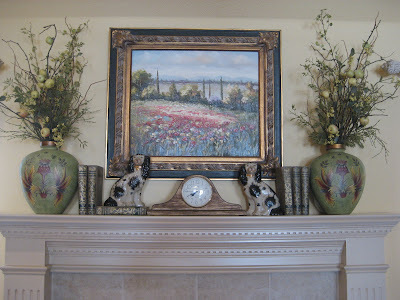 I painted my clock black and gold...it was shiny brown.I have been looking for a new clock or something interesting to go in the middle of the mantle, but have yet to find it. There is a plug in that needs to be covered. I also added some books and set one of the dogs on top of one. It's good for now, but who knows...I might change it again! lol... Thanks for your visit! 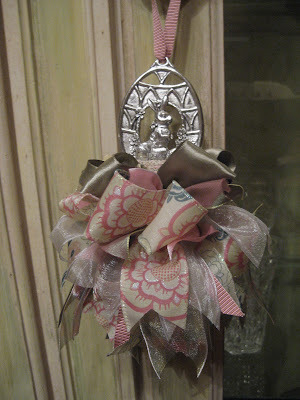 I have been busy with tassel orders...but I am listing some new ones today, so be sure and check them out! Hey Guys! I hope you are all having a wonderful week! I've been busy playing in the snow and making new items for my Etsy store. Ok...maybe not playing in the snow...too cold! We got almost 7 inches on Friday...it was beautiful!! Sad to see all of those snowmen melt:( Have you ever tried snow ice cream? It's really yummy and easy, it's just milk, vanilla, sugar and cocoa mix if you want to make it chocolate. I'm really hoping for more snow...I just love it! But I'm also ready for spring, we've got at least another month and a half so it might as well snow! 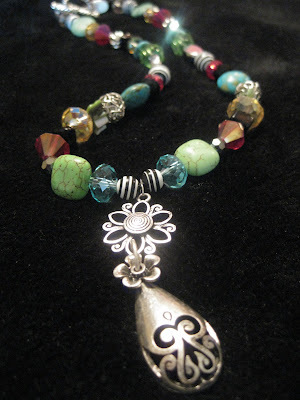 Back to my items...speaking of spring...I know we will all be wanting to spruce up our homes and maybe wardrobes for the warmer weather, so I thought I would make some tassels and jewelry. 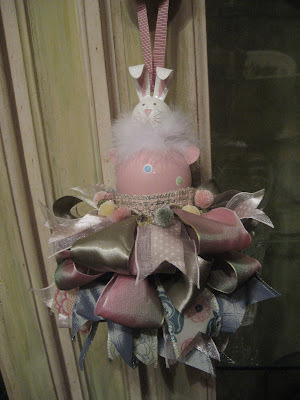 I have made Christmas tassels before, but wanted to make some for spring and everyday. Everything you see here is listed in my Etsy store on the left hand side of my blog. 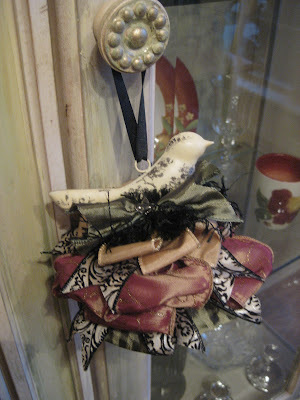 I found these cute metal birds and just had to make them into tassels. 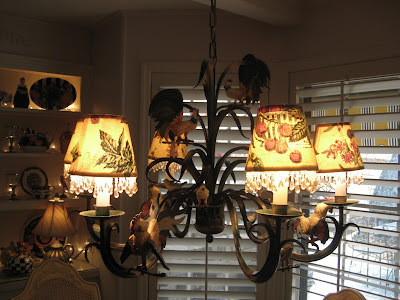 These are pretty big, so they would look good hanging on a piece of furniture, large candle holder or lamp, even a doorknob or bed post...just about anywhere! 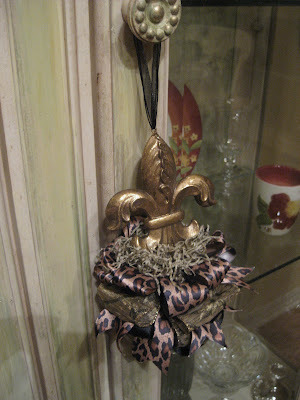 The cross and Fleur De Lis are both very elegant. Here is an idea of what one looks like on...Ha! Do not enlarge this pic, it's already close enough...lol! 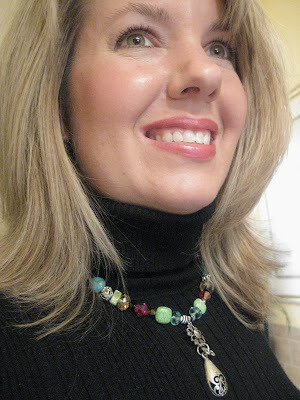 I like these necklaces because they have so many different colors and can be worn with just about anything. Now that sounded like a real sales pitch! hehe! 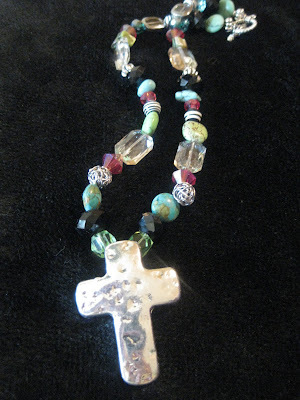 I will also have bracelets and earrings in my store soon. 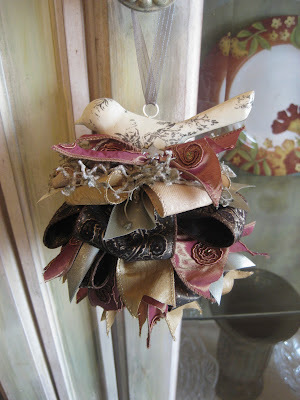 I am really getting back in a creative mood! I lost it a little bit after Christmas...it seems to come and go! I think we all have times like that...Have a great rest of the week!